Whenever I make a post, I tend to walk a line between showing what I am doing and showing you what you might want to do. It’s only fair, right? I hope I can, you know, teach something…if by bad example at the very least. An oddity of this way of life is that I never (and I do mean never) have produce in the refrigerator. It’s all fresh-picked and home-grown with the exception of lemons, my one nonlocal shame. The only things that do go into storage now are garlic, onions, shallots and potatoes….and apples. Everything else is readily gotten out of the greenhouses or garden year-round: it’s a great way to be, just grabbing a bowl and walking outside for dinner’s celery and carrots, parsley and green onions. Greens like cabbage, collards, kale, mustards and turnips are available for most of the year. And salad, all other root veg and all manner of herbs are here year-round. It’s late winter now, burgeoning spring…thanks to the mild winter, spring is appearing terribly early this year, and who cares what the groundhog and the Farmers’ Almanac have to say. Migratory birds are my first clue that the season has changed. I should say “the migratory birds’ effect on my yard birds,” because the turkey vultures, redwing black birds and even the dang Canada geese are freaking out the chickens who understandably think every bird shadow is a hawk on the wing. The vultures, who fly in family units, haven’t established themselves yet; it takes a bit of time for them to hone in on their territory, though I know they’re around. The redwings though are very keen to plant their flags on some waterway or another, and the melodious male is back in the yard again…even though our frog pond is embarrassingly tiny. The frogs (also out and croaking) don’t agree that it’s tiny, though. I also know it’s late winter because it’s mid-spring in the greenhouses and we’re in a panic to eat everything. I got a sunburn Saturday (and even took my shirt off, because, really, who can see?) while I was doing work in there. What’s fine for the plants is actually a bit too hot for its human caretaker. It did feel nice, being sweaty…considering the maple sap is still dripping and all. But it is true: I am in a bit of a panic. The potatoes will soon sprout, the onions already have, and even the softneck garlic is looking a little green. Ir is time to transition. The arugula, mache, mizuna and claytonia (winter’s favorite salad greens) are all madly going to seed and tasting nasty as they do. 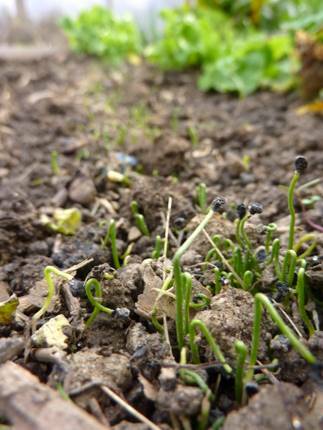 My seeds are sprouting well in the greenhouse beds, but so are the weeds. Of course I wish that every last one of you had chicken coops and greenhouses in your yards. But I warn you. Remember that crazy period in summer when you just can’t possibly eat another zucchini, and what are you going to do with all those cucumbers and tomatoes? Get a greenhouse and this will happen to you four times a year…maybe five. But if you do you’ll never have produce in your fridge and you can suntan in your underwear in March! Just a suggestion on avoiding your non-local shame… collect sumac seed heads! I’ve only used them for “lemonade” thus far myself, but am thinking that they could be used for all sorts of things, particularly if you were to condense and can their “juice”. Just collect them in late summer when they’ve matured (and preferably not just after a rain) soak them in hot water, and it’ll become quite sour. I believe you can use any red-berried variety (staghorn, winged/shiny sumac seem to be what grows most here) except for poison, which has white berries. All the good varieties will have red berry clusters. You can always tell when they’re ready by tasting one or two (really more of a seed than a berry). They should be quite sour when ready. Now you’ll have another way to use up that abundance of free time that all of us farming types seem to have 8^) One bit of caution however — some people have allergic reactions to sumac, which is in the same family as poison ivy and cashew nuts. Birds are crazy here too, it’s like a switch turned on! I’m also totally okay with hanging out in a tank top in the hoop house in March–it rocks! Ok, help on the leeks. We planted starts out in the garden last weekend (our first leeks, we’re trying new stuff). We will transplant when they get a bit bigger. How do you grow leeks, how do we know they are ‘done’, and just HELP! in general. 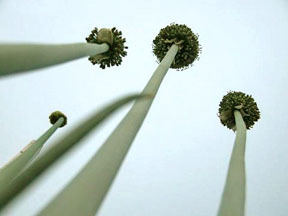 Leeks: once they get to be the thickness of about a pencil (but I often do not wait that long) I plant them. To encourage a nice long thick white part, I bury them deep–up to where the leaves start–in a drilled hole (I have a piece of rebar about a foot long to do this). You don’t really need to pack the dirt around them; just leave them in the hole with a bit of dirt thrown in. They’ll bury themselves. (Alternately, you can dig a deep ditch and plant a row of them that way.) They should be ready to eat this fall/winter. They’re biennials so they’ll start getting fat in the spring and will bloom…and then they’re done! You’ll love them, Jules. They’re loads easier to grow than onions. We LOVE leeks. Thanks El. This certainly will help! So, once they start to bloom, then they are done? Great, thanks. If there was dirt on your dinner 20 minutes earlier you are living right….. Refrigerators are (practically) just for milk and what meat now in the cohutt household. Ever try Zucchini Carpaccio.It’s really really good with fresh from the garden Zucchini.